When Tucker Houston becomes a schoolteacher out West, she never expected to encounter Lucas Steele, a handsome wagonmaster who would soon steal her heart away, but when a ruthless, savage man joins the wagon, Tucker must fight for her new love. 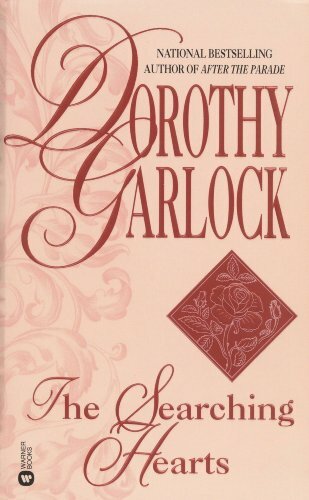 Available for the first time in more than two decades are two classic tales of romance by "New York Times" bestselling favorite Dorothy Garlock, packaged together in one volume. Nona Conrad has been making it through "by the hardest.­" Each day is a struggle - to go on after her parents' sudden death, to win her rightful inheritance from her untrustworthy half-­brother, and to raise her high-­spirited younger sister. Hired to manage a fishing camp deep in the Arkansas woods, the strong-­willed redhead is eager to settle down - until she clashes with the camp's new owner. Simon Wright persistently dogs Nora's steps and is instantly drawn to her. But is he an ally or a charmer with his own agenda? While Nora decides, someone driven by greed will do anything to find out what she knows - and soon Nona and Simon will have nowhere to run. Adrianna Moore has just had a double shock: the death of her father and the discovery that he has left his entire estate to his lawyer. The lawyer, a repulsive social climber, tells her that to regain her inheritance, she must marry him A WEEK FROM SUNDAY. Adrianna takes off, driving desperately to a new life. Caught in a violent rainstorm, she collides with an oncoming truck. Quinn Baxter, the driver of the truck, demands repayment for his lost cargo. They reach a bargain: she will live in his home, tutor his bedridden younger brother, and play piano in Quinn's tavern to pay off her debt. Drawn to the rugged Quinn, challenged by the interaction with the tavern patrons, she also must deal with an intractable foe--­Quinn's housekeeper who is scheming to become his wife. And all the while, the spurned lawyer is following Adrianna's trail, determined to find her and force her to marry him. DOROTHY GARLOCK...­is a New York Times extended list bestselling author, "a gifted writer" (Chicago Sun-­Times) who celebrates the indomitable American spirit and the triumphs of the caring heart. Now she vividly portrays the era after World War II, when men and women torn apart by years of combat had to rebuild marriages and lives...­Rawlings, Oklahoma, 1945. Johnny Henry is coming home from the Pacific, and his estranged wife, Kathleen, secretly watches him step off the train to a hero's welcome. Her heart races when she sees him; his breaks when he doesn't spot her. Misunderstanding and tragedy had destroyed their marriage right before he shipped out. Now Johnny's pride will keep him from confessing how wrong he had been; now Kathleen's hurt will stop her from running into his arms. But when a disturbed stalker plunges Kathleen into a real-­life nightmare, her only hope is Johnny -- and a love that can bring two hearts through every battle, especially the one within. When 23-­year-­old Kristen Anderson received word that her uncle had died and left her his Larkspur ranch in Montana, she at least had a choice in life. Relegated to the role of servant in her brother's house, she had accepted her fate, but now she had a chance to live on her own. Over her brother's violent opposition, she boarded the train in Eau Claire, Wisconsin. On her arrival in Big Timber, Montana, she found a suspiciously eager buyer waiting to purchase the ranch she had yet to see. With a little help from a local citizen, she evaded the schemer and made her way to the ranch, only to find two men living on her land: one young, strong, and with ideas of his own about the property; the other sad, senile, and completely dependent. Kristen had inherited trouble with her legacy--­and mystery. Would the two men help her fight the venal Forsythe forces who sought to wrench the ranch from her? Would she meet life or death here? Would she discover undying hatred--­or eternal love? . . .